Scooper - Technology News: The global economy grew last year, carbon emissions didn't. What's going on? The global economy grew last year, carbon emissions didn't. What's going on? Maybe it wasn’t a blip. Last year, the International Energy Agency announced that, for the first time since they began measuring 40 years ago, the global economy had grown while carbon emissions remained flat in 2014. Last year, it happened again . There have been other pauses in emissions growth, but they were associated with economic downturns. The early 1980s, 1992, and the global financial crisis in 2008-9, were the only other times when emissions have not risen, the IEA said. But in 2015 the global economy grew by an average of 3%. The news has potentially huge implications for the work being done to tackle climate change. It doesn’t mean we’ve reached the goal, since emissions are still too high to achieve a less-than-2-degree temperature rise—the international target, set to avoid the more disastrous consequences of a warming planet. But the new data confirm news that was “surprising but welcome” when it emerged in 2015, said Fatih Birol, the IEA’s executive director, in a press release. One big driver of emissions reductions has been the increase in renewable energy. As much as 90% of new electricity generation in last year came from renewable sources, according to preliminary IEA data. China and the US, the world’s largest emitters of carbon, both pumped out less. 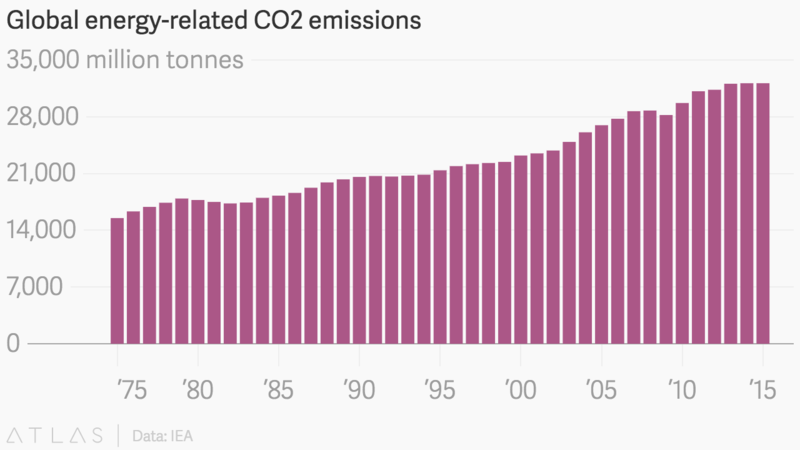 China’s emissions declined by 1.5%, mainly due to less coal being burned. Meanwhile, low carbon electricity sources increased to make up 28% of China’s production, from 19% the previous year. Hydropower and wind were the main drivers. The US managed a 2% emissions decline, mostly due to closing coal plants and replacing them with natural gas.